Original Recipe Slatherin’ Sauce really makes the tomato braising sauce jump with tongue-tingling pleasure. These can be fully prepped and cooked a day or two ahead and gently re-heated before serving. Savoy cabbage leaves are pretty and delicately crinkled and the flavor is milder than regular green cabbage. But, if you can’t find the former, feel free to substitute the latter. Begin by prepping the cabbage. Once rinsed, trim off about 1/2” of the base, and gently peel the whole leaves, one by one, away from the cabbage head. Be delicate! Cut out the tough stem in the center of the larger leaves with a paring knife and discard. As you get closer to the center, the leaves will be small or even partial. Save these small parts for later. Rinse the leaves thoroughly. Bring a large pot of cold water up to a boil over high heat and add the 2 teaspoons salt. Once boiling, submerge all of the cabbage leaves into the hot water, pressing down with a spatula to cover. After two minutes, drain the leaves in a colander and refresh by running cold water over them. Arrange the leaves in a single layer on a couple of clean kitchen towels to dry. Meanwhile, prepare the filling. Bring the rice, water and salt up to a boil over high heat in a small saucepan. Stir once. Cover the pot with a tight-fitting lid, reduce to a gentle simmer, and cook for exactly 20 minutes. Fluff with a fork and set aside to cool to nearly room temperature. (Note: You can speed things up by putting it in the refrigerator). In a large bowl, combine the ground beef, onion, garlic, 1/2 cup Slatherin’ Sauce, salt, pepper, chili flakes, fennel seeds, fresh basil and egg. Combine well using clean hands. 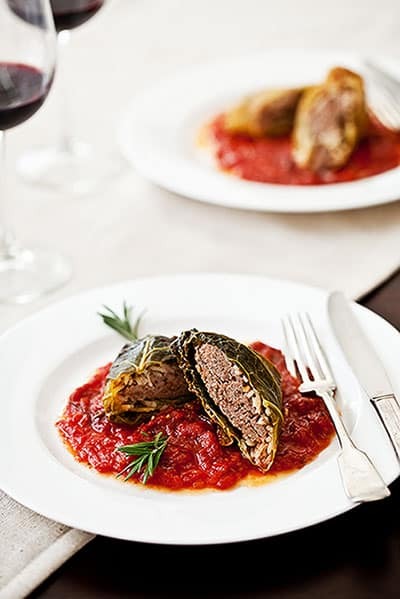 To assemble the stuffed cabbage purses, find the most attractive and biggest leaves and set them aside. Take one and arrange it on your work surface. If there is a hole where the stem was, top it with one of the smaller leaves or leave parts. Drizzle the center with about one tablespoon of the rice and arrange it evenly along the leaf. Top this with a heaping 1/4 cup of the meat filling in the center of the leaf and press down to flatten. Top with another small leaf part. Wrap the edges of up and around the meat center, trying to form a seam at the bottom where the cabbage leaves meet. Insert with 3 or 4 toothpicks wherever the leaves need a little help staying together. Repeat with remaining leaves and filling. (Note: They can be prepped, covered tightly with plastic wrap and refrigerated overnight at this point, if desired). You should have anywhere from 6 to 8 stuffed cabbage purses. Separately, pour the tomatoes and their juices into a large Dutch oven or heavy-bottomed cooking vessel. Smash them with a potato masher to break them up into a chunky puree. Stir in the garlic, Slather Brand Original Slatherin’ Sauce, salt and pepper to taste and combine. Bring up to a low simmer over medium high heat. Scatter the fresh rosemary on top. Gently place each stuffed cabbage purse on top of the braising sauce, seam-side down. Be careful not to crowd or tear the purses. Cover, reduce the heat to medium low, and cook for 30 minutes. Remove the cover, and gently turn the cabbage purses. Cook another 20 minutes. Remove the cabbage purses and arrange on a holding plate, covering loosely with foil to keep warm. Meanwhile, increase the heat of the cooking sauce/liquid to high and reduce by half. Remove the rosemary sprigs. Arrange the cabbage purses on a platter or individual plates garnished with fresh rosemary sprigs or fresh basil leaves.